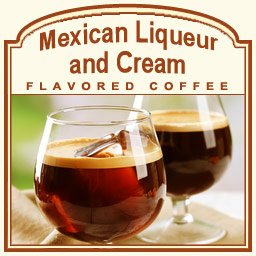 This spicy and sultry flavored coffee will hit the spot with its delicious full blast of Mexican Liqueur and cream. Richly creamy, this Mexican Cream liqueur features a refreshing flavor that will make your taste buds zing with excitement from its molasses-infused flavor and strong, aromatic scent. With only 2 calories in each cup, you can indulge in this flavored coffee over and over again � without feeling guilty. Made with 100% authentic Arabica beans, the Mexican Cream Liqueur flavored coffee offers a true gourmet taste. Roasted and shipped on the same day, this Mexican Cream liqueur will add an extra pizzazz to your day. Packaged in a heat-sealed valve bag, this Mexican Cream coffee will hit the spot with its one of a kind taste that will spark your taste buds into thinking you're on a dreamy Mexican adventure!